I had a really interesting time doing the concentric hexagon quilting on my Modern Hexagon Quilt. So I've been wanting to try concentric quilting again, this time with concentric circles. I thought, what better than to make a water theme quilt? 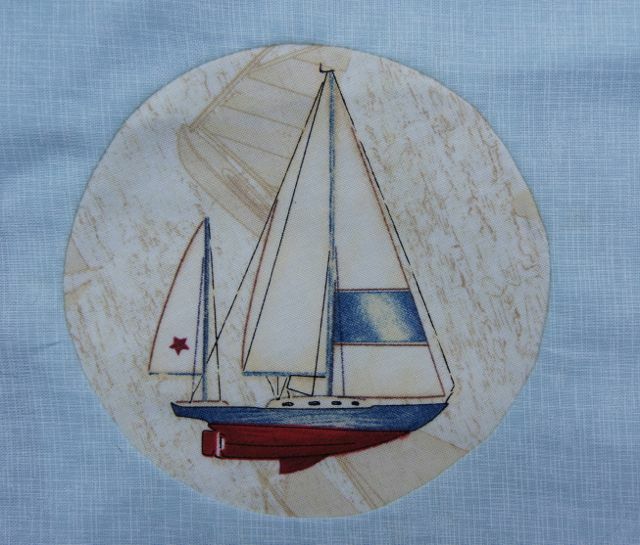 In my stash I found a very traditional fabric collection, "Gone Sailing" by Wilmington Prints. 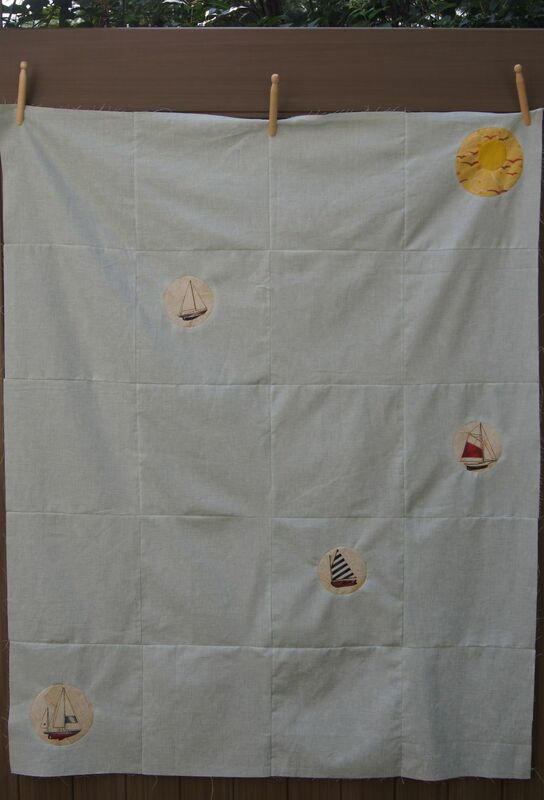 The sailboats on the cream print fabric are spaced widely enough to easily fussy cut it. I decided to make it Modern by putting in the sailboats into a quilt top with lots of Negative Space using Cheryl Arkinson's Reverse Circle technique. 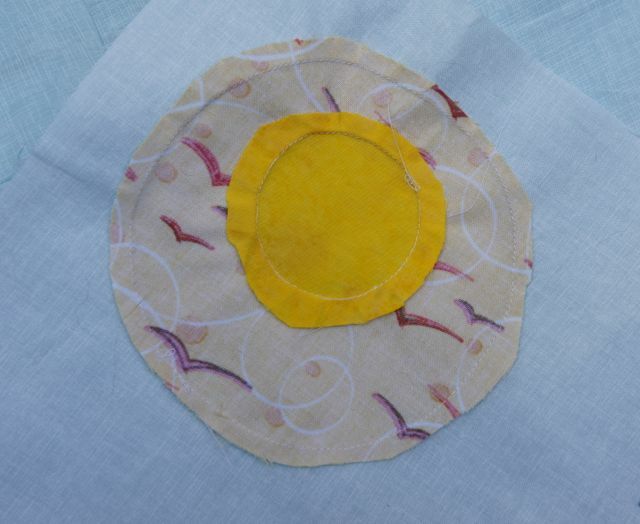 She has a great course, "Inset Circles and Applique by Machine" on Craftsy which explains how to do Reverse Circle which I highly recommend. You may also learn how to use her Reverse Circles technique in her chapter in the new book, Essential Guild to Modern Quilt Making published by Lucky Spools. I've used Cheryl's Reverse Circle on several projects. This time I found that the block with the double circles finished about 1/4 inch smaller than the original cut and it slightly irregular. I had cut 10.5 inch square unfinished blocks for this quilt. But they ended up 10 inches square after I squared up the blocks with the circles. Next time I'll cut the blocks with the Revere Circles larger than needed! The fabric I chose for the quilt top is Robert Kaufman's "Quilter's Linen". This is great fabric--cotton with a linen like print on it. One note of caution: It seems to be a fairly loose weave and ravels easily. I made 4 Reverse Circles in the quilt top for sailboats and a double reverse circle for the sun. Here's the back of a boat reverse circle. The sun block is made with 2 different fabrics. The yellow fabric with the gulls and bubbles came from a bandana that Whitney, Taffy's groomer, put on her after a "day of beauty". (This shop cuts up fabric to make bandanas). I really liked the fabric in this particular bandana. I immediately took it off Taffy, ran it through the wash, and then added to my stash! The quilt is sandwiched and basted. I am off to my sewing room to try quilting multiple concentric circles!